Europe has experienced something of a mini-heatwave this past week. For April the temperatures across the UK and continent have been rather pleasant and with the sun shining it often makes most of us think summer has arrived. While it isn’t technically summer as yet it is just around the corner and for many that means taking in the beauty of your own country or jetting off for some well-deserved rest or adventure. As the world is ever more connected these days many of us carry a range of internet enabled devices which often allows us to carry out some of the mundane tasks from home. Checking work emails, paying household bills and updating social media statuses have all become commonplace these days. Here’re our 5 top tips to stop criminals ruining your summer holiday! No matter how many times I tell people this it still seems to fall on deaf ears, that is until it’s too late. For those who aren’t aware, when connecting to any Wi-Fi system that isn’t your home connection you run the risk of having private details stolen and even the possibility of having accounts such as Facebook hijacked by an unscrupulous hacker. When you’re on holiday either in your home country or abroad you will likely connect to public Wi-Fi. This can be a hotspot that has a password or even just an open hotspot. For safety, you should consider that anything you do while connected could potentially be seen by someone else. There are a few ways in which you can make using the internet on Wi-Fi hotspots more secure and I’ll look at these further in this article. As a good rule of thumb if you don’t need to do it, don’t and if you can leave it until you get home to use your own connection then do. Although public Wi-Fi is generally unsafe you can increase your security by accessing websites that use HTTPS. HTTPS is a secure system that encrypts data between yourself and the website. So if you visit Facebook for example anything you access is encrypted if HTTPS is showing in the address bar. If a secure version of the site is not available then you should assume that anything you do on that site is readable by someone else. For other programs such as an email client on your laptop or other device, it is worth checking that you are using SSL in the settings. This will encrypt your email connection and stop people being able to read your emails and potentially steal your login and password details. Many aspects of using the internet on public Wi-Fi are open to abuse by others and if you’re a business traveller or checking work emails having your login and password details stolen could be disastrous and really end up spoiling your holiday. Even if you’re not doing work related activities while away having your social media account stolen is basically like have your identity taken and who knows what someone could do if they started impersonating you via social media to your friends and family. A really useful tool called a Virtual Private Network or VPN to give it its shortened name is a way of encrypting everything you do on your device and sending it securely across the internet to a location it can then be safely decrypted before being passed on to the wider internet. This effectively removes the ability for anyone to spy on what you’re doing. So if you can’t access a website via HTTPS or your email client isn’t working with SSL then with a VPN service you can rest assured that anyone else on the same Wi-Fi network will not be able to access any of your sensitive details. A VPN tool sits on your laptop, desktop or mobile device and takes care of the encryption for you so there is very little user interaction. There are thousands of companies who provide VPN services some of which can be compared in our VPN Comparison Guide. However if you don’t have time to spend comparing all the various options I recommend signing up to IPVanish who are extremely easy to use, comparably cheap and have software and apps for all computer systems including tablets and mobiles. VPN’s are so good in fact that even the US Government recommends using one for public Wi-Fi hotspots. Mobile apps have revolutionised the way we carry out tasks on our mobile phones and tablets. Rather than open a web browser and access a website we now use apps that basically do the same job in a smaller and more direct manner. Using apps when on holiday is one of my favourite ways of accessing information and services, I’m not one to want to waste the holiday experience so if I do want to do something internet related I quickly open an app. Leading internet security company Kaspersky reported that 11 popular apps that are widely used which they tested were unsecure. Some of the most well-known apps most people use daily are listed and will surprise you! To avoid your details being stolen when abroad make sure you don’t use sensitive mobile apps on public Wi-Fi hotspots including the hotel unless what you’re accessing you wouldn’t mind others knowing about. So if you wanted to access BBC News then fine, but sending emails should be considered a no-no unless you know for certain the app is using a secure method of data transfer. One way to secure mobile apps that you’re unsure of their security credentials is to use a VPN service as detailed in the section above. Most good providers such as my recommended IPVanish offer apps for Android and iOS so if you really want to use mobile apps in your hotel or using public Wi-Fi then a VPN is essential to protect your privacy. Alternatively using your phone’s web browser and using direct websites that support HTTPS rather than use a providers app will ensure your data is encrypted on your mobile device. On laptops, tablets and mobile phone most people have become accustomed to leaving Wi-Fi switched on, let’s face it, it’s easier. However easier isn’t always safer and when Wi-Fi is enabled there is the possibly if set incorrectly that it can attempt to connect to any open Wi-Fi network without you wanting it to. As you pass by an open Wi-Fi hotspot your phone or other device could potentially connect automatically and then start carrying out tasks you have set-up to run without your input. Your email account could connect or your messaging app could start to download new messages, both of these situations could potentially leave your private details being exposed even without you knowing. Switching off Wi-Fi on phones and laptops is relatively simple and can be usually accessed from within the settings area but for a few common devices check our instructions below. 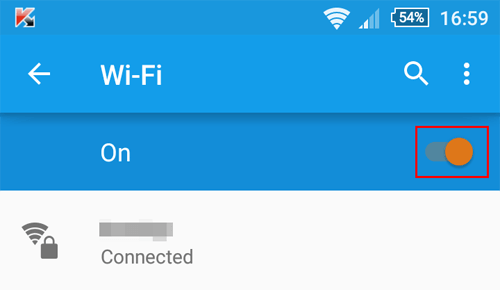 Android Lollipop (5.0+) users can disable Wi-Fi by selecting, Settings -> Wi-Fi -> Slide to Off. 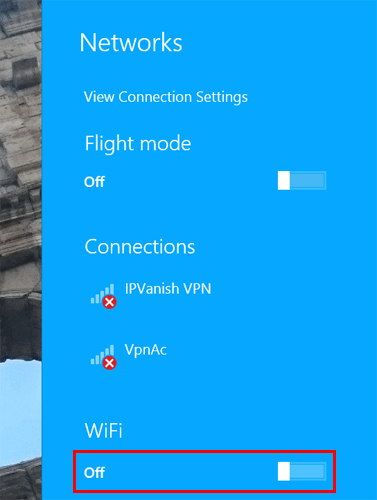 Windows 8.1 users can disable Wi-Fi by Swiping from the right -> clicking Settings, clicking the signal bars icon then Sliding to Off. So there you have it, 5 little tips that can keep you safe online while on holiday. It really is worth taking the time to carry out these basic checks and even sign up for a VPN service. Many of us remember to book travel insurance and make sure our homes are locked before we leave but our internet security is something that often goes uncared for and with more of our lives being lived online it really makes sense to start considering our digital lives. To recap, remember public Wi-Fi is insecure, that includes your hotel, cafes, restaurants and more! Use sites that offer HTTPS and SSL for email clients. Get a VPN service because they can really save the day. Limit the use of mobile apps to non-sensitive use and finally disable Wi-Fi completely or from automatically connecting to open networks. Most of all, enjoy your holiday!